Lieutenant General Paul W. Myers was born in Schenectady, NY in 1923 and completed his medical training at the Albany Medical College, NY in 1946. Initially, General Myers began his military career in the US Army but transferred to US Air Force in 1951. Subsequently, he pursued his calling as a neurosurgeon and completed a neurosurgery residency in 1956. 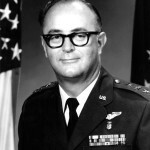 He was appointed the commander of Wilford Hall USAF Medical Center in 1971, and under his leadership and insights, Wilford Hall grew and drew active duty patients from around the world. In 1978, he was promoted to the grade of lieutenant general and became the Surgeon General, the senior-most Medical Service officer in the US Air Force. He received numerous decorations, awards and honors throughout his outstanding career. Even though he retired from the active duty service in 1983, his love, devotion and support to the Society of Air Force Clinical surgeons have never ceased since his membership starting 1957. The Clinical Surgeons Award established in 1983 was changed to the Paul W. Myers Award in 2000 by the Board of Governors in his honor. The 1st Place award in the Basic Science session is given on behalf and recognition of LtGen Paul Meyers.